A major survey of the south field at Rocky Clump was conducted by David Staveley in late March, prior to the commencement of the new season of digging. The machine used was a magnetometer and the readings revealed ~ whole range of new features which had not been observed in the resistivity survey conducted a number of years ago. The new results show a number of further ditches and numerous other features which could be either archaeological or geological. Digging started at Rocky Clump at the end of March and there are several large ditches at the site which could confirm that we have a late Iron Age or early Romano-British enclosure. A curious second enclosure has been revealed to the west of the original one and this will be investigated either this year or next. Beacon Hill is another ongoing project and it is planned to return to the hill in the late summer after ground nesting birds have left the area. The hill appears to have remained unploughed for centuries, and may retain vestiges of an ancient landscape associated with the long barrows already known about. David Staveley is also interested in surveying the possible Romano-British enclosure located in the field west of St Dunstans. It is hoped that this will commence in the autumn if the weather conditions are good and the farmer is happy to allow us access to the field. The new season at Rocky Clump began in late March following a magnetometry survey of the south field by David Staveley. The results of the survey revealed a large number of new anomalies, including several ditches that were not visible on the previous resistivity survey. A new area was opened up using a mechanical digger and an U shaped trench encompassed both the east/west ditch and north/south ditch revealed in the previous season's digging. The object was to confirm the location of the ditches and then work inwards to investigate the interior of the possible enclosure to seek evidence for any activity or settlement within this ancient boundary. The excavations have uncovered a pair of new ditches running in an easterly direction. The middle ditch is marginally smaller than those previously found and produced a chalk fill with a limited number of finds. A causeway, created from a dump of chalk, appears to cross this ditch and recently a number of linear features have been located north of this feature. The lower east/west ditch has been quite an interesting feature. It is a sharp ~v'-shaped ditch at the west end, but begins to widen out as it progresses eastward. Finds from this ditch have been numerous with significant quantities of pottery, including several pieces of samian ware, and numerous amounts of animal bone. Among the animal bones found was the complete skull, including the horns, of a cow. Another rare find was a silver finger ring which is now at the British Museum for recording. Perhaps the most significant find of the season so far has been the uncovering of a complete baby burial in the upper ditch running east/west. The remains are now with Carol White, our bones expert, for accurate and detailed recording. The weather this season has included several days of rain, which has had an impact on the digging, and numbers of diggers are down on last year, especially those from abroad. However, the excavations are still bringing in new faces and numbers are beginning to increase with the warmer weather. The excavation will continue until late October, or beyond, with a possible extension to the trench if the number of diggers continues to increase. There will be two finds processing days in the New Year when pottery and other items from the excavation will be marked and catalogued. One of the most intriguing finds from the Rocky Clump 2011 dig was the large midden of mussel shell so carefully excavated by Clive (Fig. I). I he shells have been identified by Lee Ismail of the Booth Museum of Natural History, Brighton, as being from the common blue mussel Mytilus edulis. The first indication that this was not just one single deposition of shells was that the shells were found in several, subtle, contexts within the midden. However, the different contexts were not so well defined to exclude the pos-sibility that the midden was created in a very short time, maybe within one day, by the tipping of several basketfuls of shell - the left-overs from one "feast". Whilst the majority of shells were broken there were many intact umbos (the characteristic noses of the shell). By counting the umbos and divkling by two we get a minimum number of mussels in the midden - 3531.
e.g. see Bayne and Worrall, 1980.) It is possible that the two size cIasse~ in context 81 represent two consecutive year classes. For the purpose of this report it will be assumed that the bimodal nature of the length distribution in context 81 does represent two age classes of an intertidal population of urnssels accessible for harvesting from the shore. 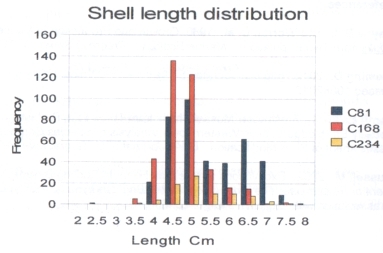 We can compare the distributions of shell length in contexts 81, 168 and 234 by dividing the three samples into two size groups, 2 - 5.9 cm length and 6 -7.9 cm length, producing a 2x3 contingency table that can be tested using chi squared test. When this test is done we find that the probability that the three contexts contain shells that were drawn from the same population is less than one in 10,000. It would appear that the mussels harvested and represented in these contexts came from different populations. This is good evidence that there are at least two separate deposits of mussel shells rather than one deposit that has been scattered over several contexts. Whilst it is possible that the different distribution of sizes was created by post harvest sorting during preparationS consumption or disposal this seems unlikely and it is more probable that the deposits were harvested from two separate populations or from one population on two occasions when there were differing size class profiles. Further work could be done investigating the shell morphologies in the samples to see if this hypothesis is supported. If the midden does represent multiple deposits of shells one can ask why they are accumulated in one place. Were they being segregated from the rest of the rubbish (which appears to be widely scattered over the length of the rubbish filled ditches)? Was it to conserve them as a possible future resource? Mussel shell tempered pot has been found in a number of excavations. 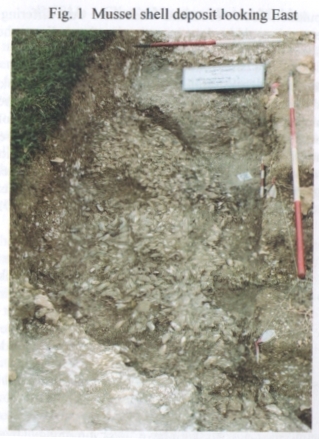 For instance, excavations at Mile Oak Farm produced some mussel shell tempered bronze age pot (Russell, 2002). Also, American Indian cultures used the larger freshwater mussel shells for temper and tools (Lamb, 2011). It is possible that the shells were dumped in the same spot time and again because that is simply what the inhabitants did out of habit or, to use a sociological concept. habitus ("cultural habitat which becomes internalised in the form of dispositions to act, think, arid feel in certain ways. ", Fleming 2012). These internalised habits can take on a very mundane nature and it would be a mistake to try to endow the actors with any beliefs about why they act in a certain way (ibid.) - they do it because "well - that's the way it's done". I think that these explanations should be considered before we fall back on the "R" word! Whilst I am open to the criticism that I have "over interpreted" this shell mid-den I feel that it is a useful exercise to consider what information can be extracted from archaeological evidence in situations where the finds can be counted or measured and illustrates the importance of careful excavation (Thank you Clive).